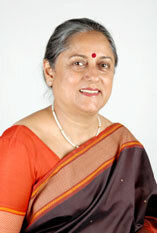 Niru Gupta, an author of 9 cookery books, graduated with Economics Honours from Bombay University. Cooking evolved as a passion after marriage, and led to various related activities like catering and classes. From there on to hosting Khaana Khazana on Zee TV for 6 months, and Meri Saheli on Star Plus, judging and demonstrating cookery programmes in Ladies’ clubs in Delhi and Kanpur. Niru wrote a monthly column in ‘Sakhi’ a Hindi magazine by the Dainik Jagran group for two years and wrote occasionally for New Woman, published from Bombay. She has also written articles for other magazines like Upper Crust, Femina and Savvy. Niru Gupta has been on the panel of ndtv.com, handling their cookery section and was the cookery consultant on ndtvcooks.com. Besides this she has hosted cookery episodes for NDTV off and on. Cooking is definitely a passion for this self taught author, who believes in trying out recipes 4-5 times before putting them in print, knowing how disappointing it is to not get the desired result after much effort! Enjoys getting her grandsons into the kitchen just to see their delight at something they have produced.